The lodge is a spectacular handcrafted log structure-spacious with 8000 square feet, geared for entertaining with two dishwashers, professional stove, granite counters and beautiful cookware and accessories….all perched on a ridge with views of the lights of Traverse City at night and the turquoise bay during the day. The lodge is located in the heart of wine country and has private dock with 200ft of frontage on Grand Traverse Bay. The rooms are well-appointed, the furniture custom designed, the floors of antique pine…bedding is all cotton with feather pillows and down comforters. There is privacy on this hilltop setting, and inside a feeling of being far away from the world…but with views to all directions. 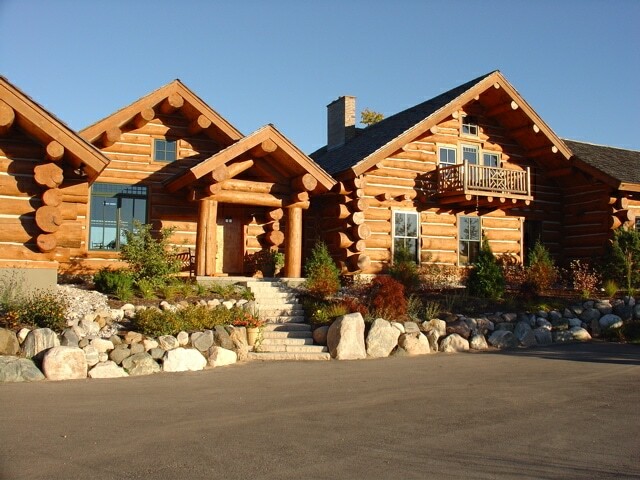 “A grand home yet cozy and intimate” is how one guest described the lodge.